Obituary – Clark, Esther Mae (Isham) « Perry High School Alumni Association, Inc.
﻿Esther Mae Clark was born on July 23, 1900 in Blairstown, Iowa and was the daughter of Henry Hall and Henrietta Florence (Wilson) Isham. She died Sunday, Nov. 11, 2001 at Perry Memorial Hospital. She began her education at Rose Hill School near Perry and was a 1918 graduate of Perry High School. After teaching awhile at the Indian Reservation at Perry, she attended Edmond State Normal School at Edmond, OK and Coe College in Cedar Rapids, IA. She was a school teacher in Oklahoma and Iowa. On Oct. 2, 1924, she and Clarence S. Curtis were married. They were married for nearly 40 years before his death on Sept. 24, 1964. Four children were born of that marriage, Keith, David, Wayne and Arlene. She and Ernest Clark were married on Sept. 11, 1970. He died in 1973. 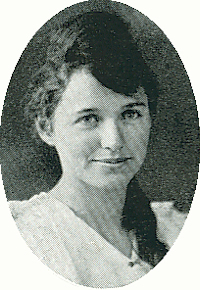 Her marriage to Ernest brought two stepchildren, Harlan and Landis Clark, into her family. During her long life, she was a member of the United Methodist Church of Norrisville, PA and the First Christian Church of Perry, OK. She also belonged to the Eureka Grange of Norrisville for 75 years and was a member of the Norrisville Garden and Civic Club and the Ladies Aid Society of Norrisville. She also was a member of the Quilters group at the First Christian Church in Perry. Her parents, her two husbands, one great-grandson and one nephew preceded her in death. She is survived her sons, Keith Curtis and his wife, Arlene, Conneautville, PA and David Curtis and his wife, Norma, Cleveland, OH; Wayne Curtis and his wife, Lila, Colorado Springs, CO; her daughter, Arlene Curtis Brown, Leland, MS; her step-sons, Harlan Clark and his wife, Mary, Perry, OK and Landis Clark; 10 grandchildren, Carol Curtis Frazier, Ron Curtis, Kim Curtis, Sheri Gozales, Richard Curtis, Mark Curtis, Rex Curtis, Scott Curtis, Lauri Sartor and Robin Pace; three step-grandchildren, Gina Bolay, Jana Naegle and Jerilyn Miller; 17 great-grandchildren, three step-great-grandchildren, two great-great-grandchildren, one sister, Ora Potter, El Paso, TX; and one niece. A memorial service will be held at 11:00 a.m. Tuesday, Nov. 13, 2001 at the First Christian Church in Perry with Rev. Steve Smith officiating. Funeral services and burial will be held in Pennsylvania. Memorials may be made to the First Christian Church of Perry.